Dalmore is not a distillery beloved of whisky geeks. This is largely because it has come to be associated strongly with much of what has gone wrong with the Scotch industry over the last 10 years or so. They have been at the front of the charge towards premiumization for premiumization’s sake with gimmicky releases like the Trinitas (which retailed for $160,000) and the Constellation series (about $250,000 for all 21 bottles), all of which seem to be aimed at helping hedge fund managers cope with the problem of not having enough shiny things to spend their money on. They also have a worse relationship with fake tans than Donald Trump and John Boehner. Premiumization per se doesn’t bother me so very much–there are many things I will never have enough money to own and even if I had that much money I would not spend it on showy whisky. And if whisky companies leave the stuff aimed at regular drinkers alone–as, for example, Highland Park and Glenmorangie have always done–it doesn’t really affect me. Dalmore’s problems are both tackiness and the fact that they pulled off as obvious a case of “old whisky in new bottles for new prices” as you’ll ever see. 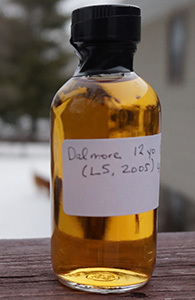 The Dalmore 12 used to be a bargain malt, available for less than $30 in most US markets, and this was also the case for their Cigar Malt. In the late 2000s the Dalmore 12 got new glitzier packaging and a 50% price increase while the Cigar Malt later turned into the Gran Reserva and more than doubled in price (confusingly a new Cigar Malt was then released at five times the price of the original). I stopped drinking both then as the new prices were no longer justified by what was in the bottle. This sample is from a bottle released in 2005, which is when I bought my first bottle, I think. What relationship it bears to the current Dalmore 12, I do not know. As with some other entry-level malts this is bottled at a lower strength in Europe. Nose: Nice sherried notes with first caramel and then citrus (orange peel) coming through. The citrus expands quite quickly and there’s some milk chocolate too. The orange switches to lemon after a while and there’s some honey too now. Quite nice, I have to say. A drop of water wakes it back up 45 minutes later and mixes the citrus with some melon and some malt. Palate: Watery but then the flavours intensify with roasted malt, citrus and something a little leafy on the back end. Texture remains a little too thin though. On the second sip there’s other, muskier fruit as well, but I’m having a bit of trouble picking it. Water’s not great for the palate–thins it out further. Finish: Longer than expected from the texture, with the roasted malt transitioning to something bitter and metallic (I have some suspicions about what that might be). Water does make the finish more interesting though, bringing out citrus that mutes the bitterness. Comments: I wish I could say that with far greater experience my 2014 self repudiates my 2005 self for having bought and drunk more than one bottle of this but it’s hard to imagine very many better values even back then at $25 for a sherried malt. At the current price though–between $40 and $50–it’s in a more competitive space and it’s hard to recommend it. Also, I have no idea if the current version is very similar to this. It does make me kind of curious about the 15 yo though which only arrived on my radar after I had become iffy about the distillery. I finished this with some 80% chocolate and it paired very well.